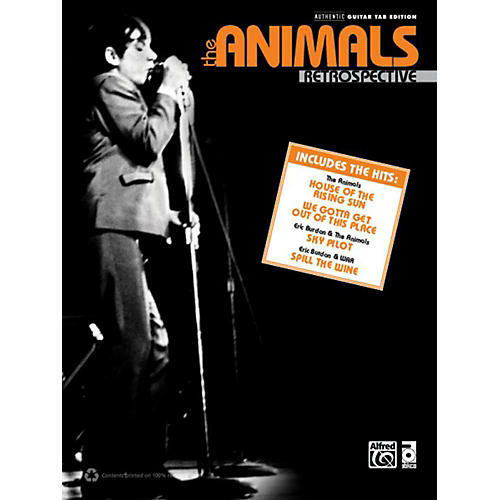 The Animals' Retrospective contains all the best from the toughest band to emerge during the British Invasion. This album-matching folio contains guitar TAB transcriptions of all the songs from that greatest hits compilation. Titles: House of the Rising Sun * I'm Crying * Baby Let Me Take You Home * Gonna Send You Back to Walker * Boom Boom * Don't Let Me Be Misunderstood * Bring It on Home to Me * We Gotta Get Out of This Place * It's My Life * Don't Bring Me Down * See See Rider * Inside, Looking Out * Hey Gyp * Help Me Girl * When I Was Young * A Girl Named Sandoz * San Franciscan Nights * Monterey * Anything * Sky Pilot * White Houses * Spill the Wine.